I can’t believe this channel has existed for over 2 years and we haven’t yet done an analysis on Moonlight Sonata by Beethoven, probably one of the most famous piano pieces of all time. But today’s the day! In today’s video, we’re going to look at all three movements – yes, there are three movements, beyond the iconic slow first movement – and talk a little history and analysis. The purpose of this video is to give you a deeper insight into this lovely sonata, whether or not you’re a music nerd or everyday general music fan. We’ll play clips from the piece so you can get a sense of what it sounds like, and talk a bit of history, theory and style. The actual title for Moonlight Sonata by Beethoven is “Piano Sonata no. 14 in C# minor, op. 27 no. 2”. It was written in 1801, and aside from being popular over 200 years later, it was pretty well-loved in Beethoven’s day as well. 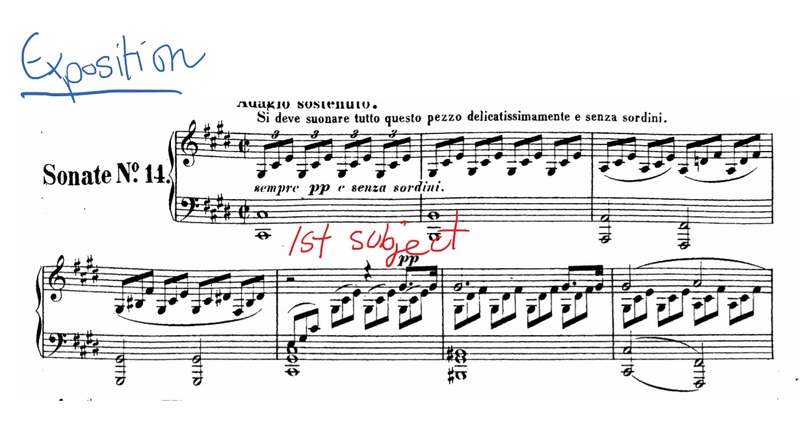 It wasn’t always called “Moonlight Sonata” – on the first edition, Beethoven gave the piece an Italian subtitle, “Sonata quasi una fantasia”, which translates to something like “Sonata almost like a fantasy” (A fantasy is another music genre, and much more improvisational). Shortly after Beethoven’s death, a well-known music critic named Ludwig Rellstab made the comment that the first movement sounded like moonlight shining upon Lake Lucerne. That comment caught fire, and within a decade it was already being published as “Moonlight Sonata”. 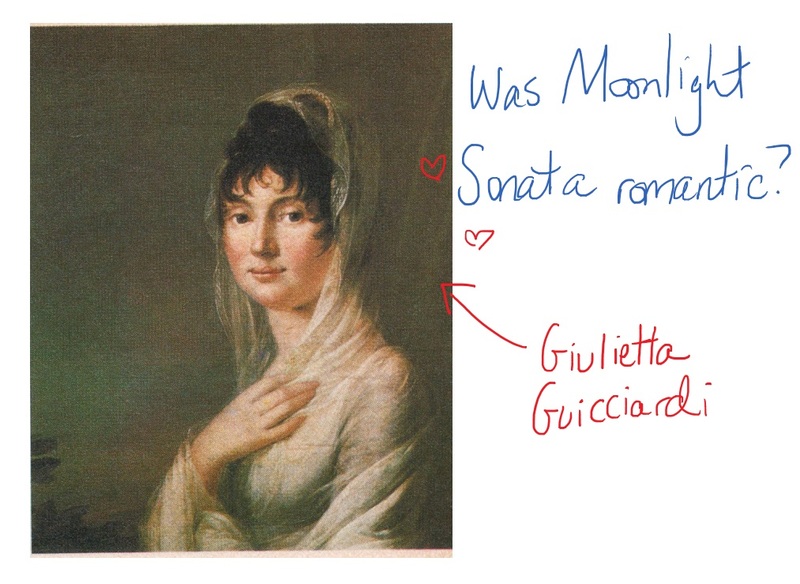 The title “Moonlight” sonata makes it sound like this is a rather romantic sonata, and people have speculated that it was meant as a sort of love song to Giulietta Guicciardi, Beethoven’s 17-year old piano student who he dedicated the piece to. However, it’s much more likely that the inspiration came from a darker place. 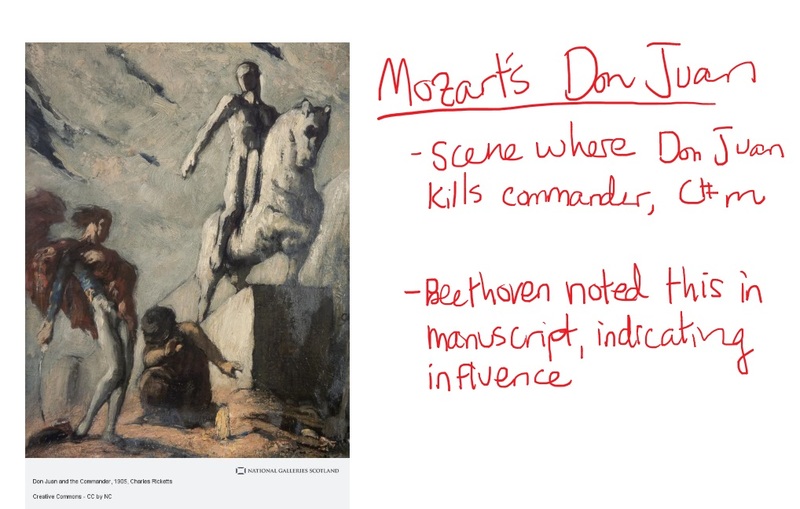 In one of the original manuscripts, Beethoven had notes from Mozart’s Don Juan, also in C# minor, from the scene where Don Juan kills the commander. This indicates to us that Beethoven envisioned more of a funeral feel to this movement, as opposed to a romantic feel. It was also written in his early thirties, around the time he was starting to deal with his hearing loss and his music style was changing. When I listen to this, I don’t hear a story of lost love – I hear a story of death and turmoil. So Beethoven was heavily influenced by Mozart’s death scene in Don Giovanni, and Chopin was later inspired by Moonlight Sonata for his Fantaisie-Impromtu. Ahh, the cycle of (music) life! This is typical of the Classical-era genre – sonatas are almost always 3-4 movements long. What is unusual about this sonata is the tempo choices. Usually sonatas are fast-slow-fast, with the slow movement sandwiched in the middle. 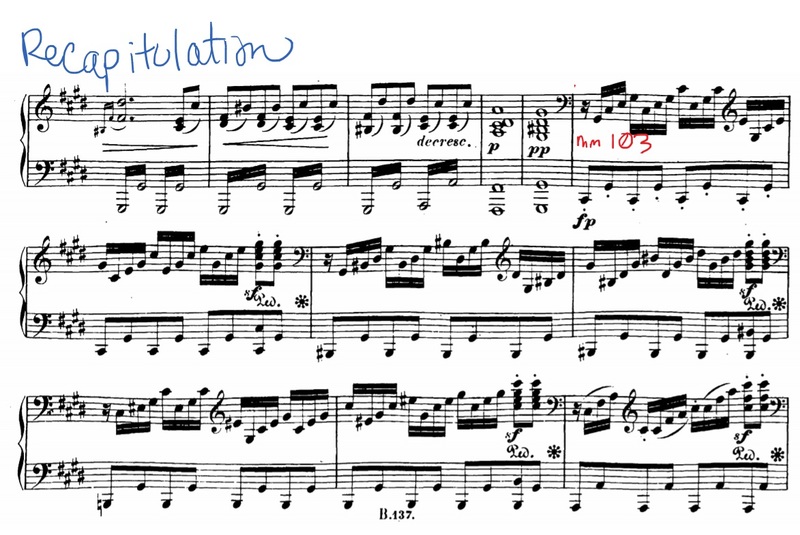 The first and last movement are almost always quite brisk. 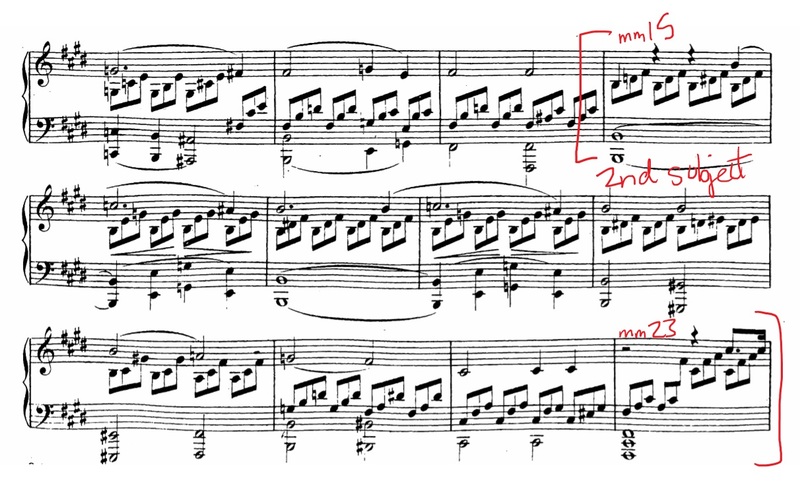 But Beethoven goes slow-medium-fast in this sonata, which was really unusual, and a testament to his rule-breaking. He enjoyed saving the most important movement for last, and did so in other sonatas (op. 27 no. 1, and op. 101). The first movement of Moonlight Sonata by Beethoven is the one that most people are familiar with – you’ll recognize it right away when we take a listen. The movement as a whole is quite quiet and somber, mainly piano/pianissimo with a few crescendos – it never grows beyond that, which is really quite restrained for passionate Beethoven. Carl Czerny, Beethoven’s piano student, also quite enjoyed it, as did many listeners in Beethoven’s time. This actually frustrated Beethoven, who said to Czerny, “Surely I’ve written better things.” It’s like Radiohead with Creep all over again. Let’s take a quick listen to a little bit of the introduction and first subject, to get the tune in your head while we talk. Throughout the movement, we have a rhythmic ostinato – Beethoven’s triplet pattern that continues without fail throughout the entire movement. This gives the piece a “rolling” feeling – it feels as though it’s swaying back and forth. The melody of this movement is very fleeting – it creates a feeling of little peeks of light shining through the pitch-black lower notes. The melody practically glistens. On a personal note, learning this movement was a revelatory piano experience – some of you have probably experienced this with pieces you’ve learned. That magical feeling like you’re witnessing pure genius, as you unfold it note by note, chord by chord. I remember the first time I learned to play the tense second theme, and being completely blown away by the brilliant harmonies. That’s one of the reasons I’m such a fan of playing Classical music. When else do you get to personally witness such genius, up close and in your own home? I get the same way when I go to art galleries – it can bring you to tears. So let’s get into some technical details. 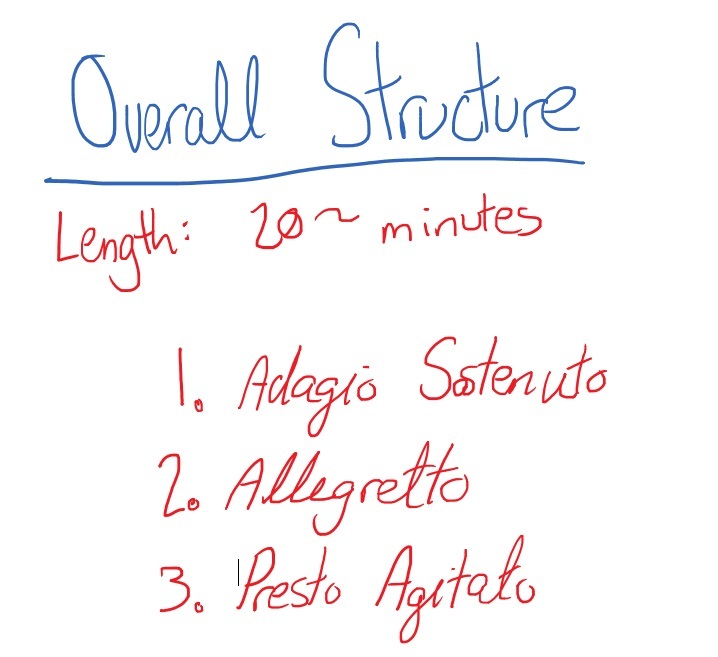 The first movement is in a weird version of sonata form (for a normal version of sonata form, check out this video). It’s got a first subject (mm. 1-5) and a second subject (mm. 15-23) in the exposition. The development section is really short (mm. 23-42), which is one thing that sets it apart from other more regular sonatas. We usually expect the development section to take the themes from the exposition and spend time twisting them around, but Beethoven doesn’t go there. This part is almost like a short bridge. And then we have the recapitulation, where the first theme (mm. 42-46) and second theme (mm. 51-60) are brought back, with the second theme being in a different key the second time around. Finally, we have the coda (ending) from mm. 60-65, bringing the movement to a close. We’ve already mentioned that Beethoven intended this movement to be “almost like a fantasy”, which means it has an improvisational feel to it. 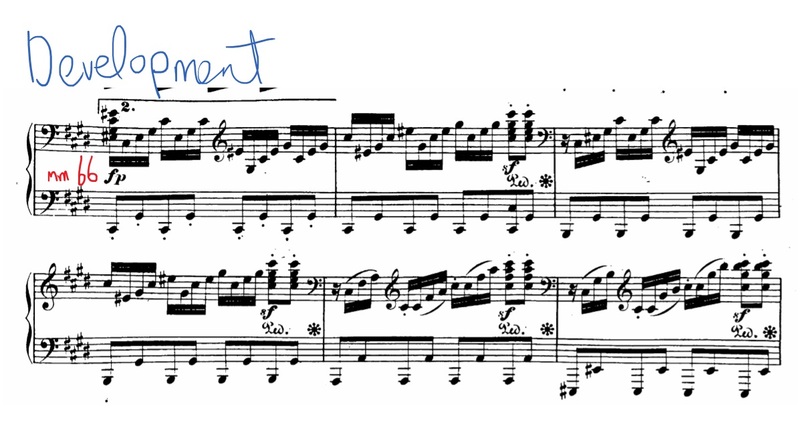 This means he decided to shirk a lot of the common harmonic progressions and “rules” of sonata form, which gives this movement a much freer feel. 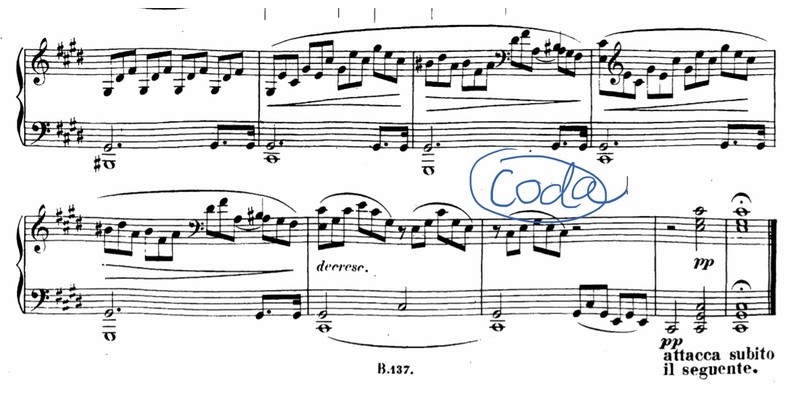 There’s a passage in the middle (the development section) where the melody drops and the notes run up and down the keyboard – this, to me, has a really distinct improvisational flair to it, almost like a little cadenza. Play around with rubato (flexible tempo) and expression in this part especially. Let’s take a quick listen to that part from the development section – it’s full of diminished chords, and very tense. The final clip I want you to listen to is from the recapitulation. It’s the second theme, which we haven’t yet listened to. You’re all probably familiar with the famous first theme (which we started the listening with), but this second theme is my favorite. It’s really powerful, and always feels exciting to play. If you’re learning this on the piano, or plan to soon, it’s a great place to experiment with the una corda, or “first pedal”. This is most of my students’ first introduction to using the softening first pedal, and sounds great in the pianissimo sections. And you want to use this pedal while simultaneously using the damper pedal as well. Another challenge of playing this is that the melody notes in the right hand are mainly performed with the pinky, and, as such, it’s really easy for that note to disappear, instead of cutting through the accompaniment like it’s meant to. I was personally inspired by Claudio Arrau for my interpretation of this movement – he plays very slow, and with incredible expression. The triplet pattern never sounds mechanical, and his melody is so clear. Of the three movements, this is the one that people are generally the least familiar with. It’s your average minuetto and trio, and pretty unremarkable. This movement reminds me of a palate cleanser. The first movement has a really strong flavor, so you need a little plain food and drink to reset your palate for the equally strong flavor of the final movement. So I don’t think it’s unremarkable because Beethoven was phoning it in – I think it’s unremarkable very deliberately. Anything more would have been “too much”, too overwhelming. Franz Liszt described the second movement as a “flower between two chasms”, which is much more poetic than my food analogy. 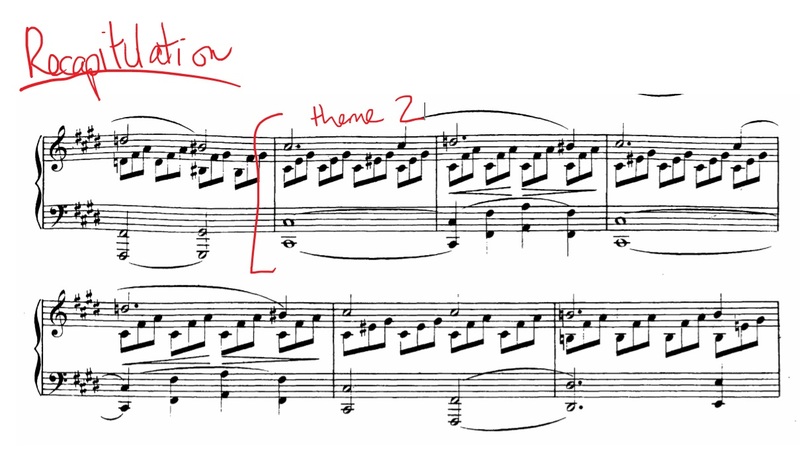 On the technical side of things, this minuetto and trio is a little unusual because both the minuetto part and the trio part are in the same key. 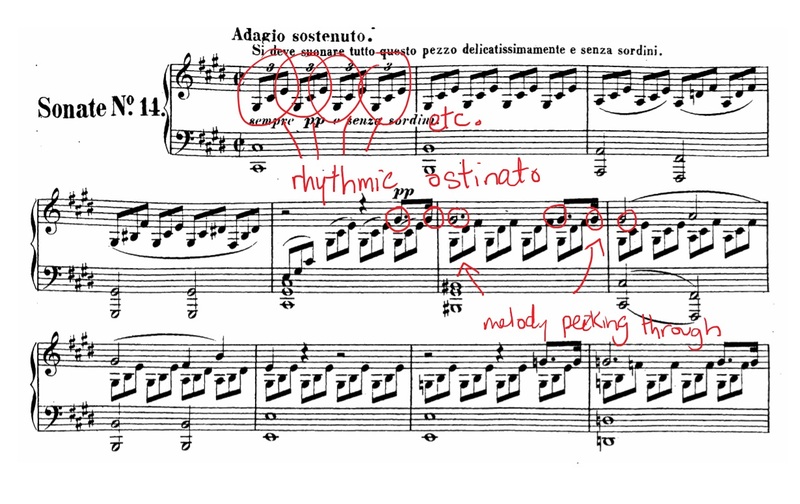 Usually the composers will switch up the keys, but Beethoven kept things really simple. 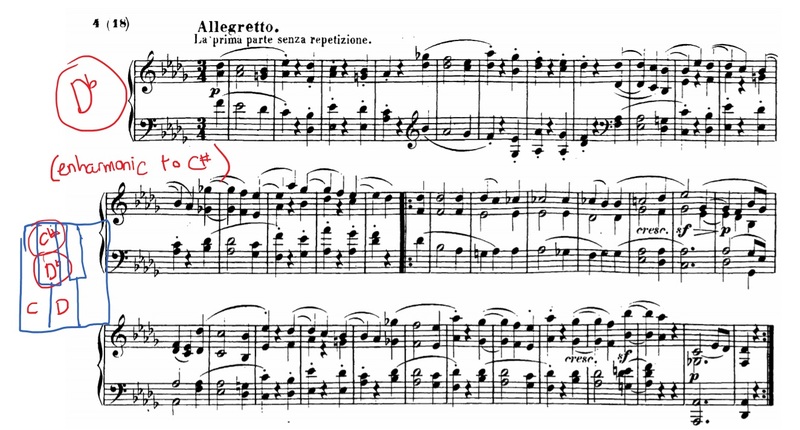 It’s interesting, too, that this minuetto and trio is in the key of Db major. 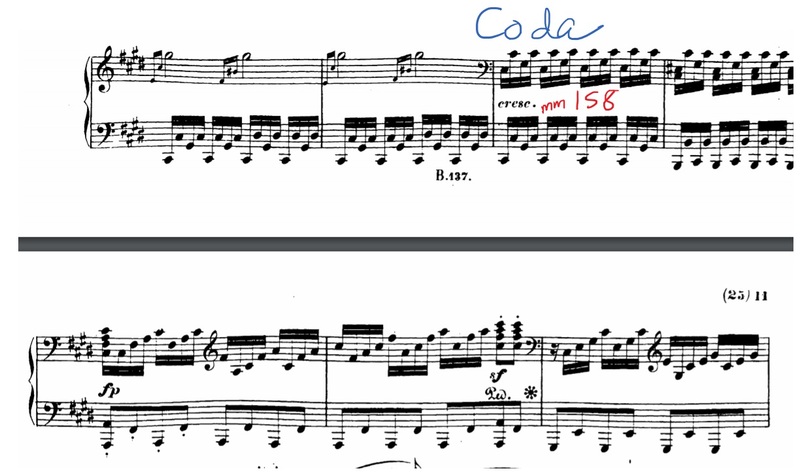 The first and third movements are in C# minor, which, if you picture a keyboard, is actually the exact same note as Db. We call these keys “enharmonic”, meaning they’re different names for the exact same note on the piano. The flat version has a couple white keys, whereas in the sharp version, literally every note is played sharp. It’s hard to mentally digest that. The same goes for writing in C# minor versus Db minor. 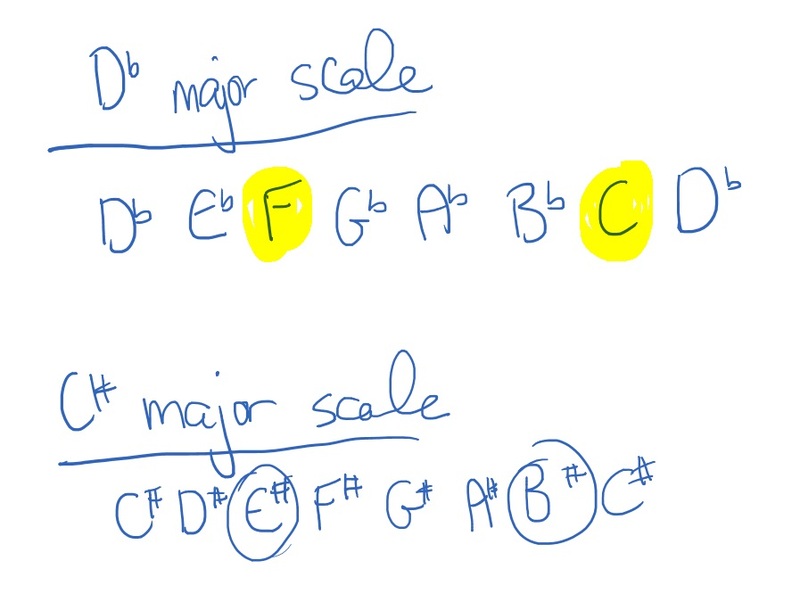 So if you’ve ever wondered why composers write in enharmonic keys (C# instead of Db), that’s usually why. Let’s take a quick listen to the minuetto (first part), and we’ll follow it directly with a clip from the trio (second part). This is a really exciting movement, and one that I featured in the video “Classical Music for People who don’t Like Classical Music”. The mood is dark and heavy like the first movement, except this time it’s loud and fast and exciting. It’s best described as ferocious, powerful and passionate, and it’s the movement that requires the most skill. 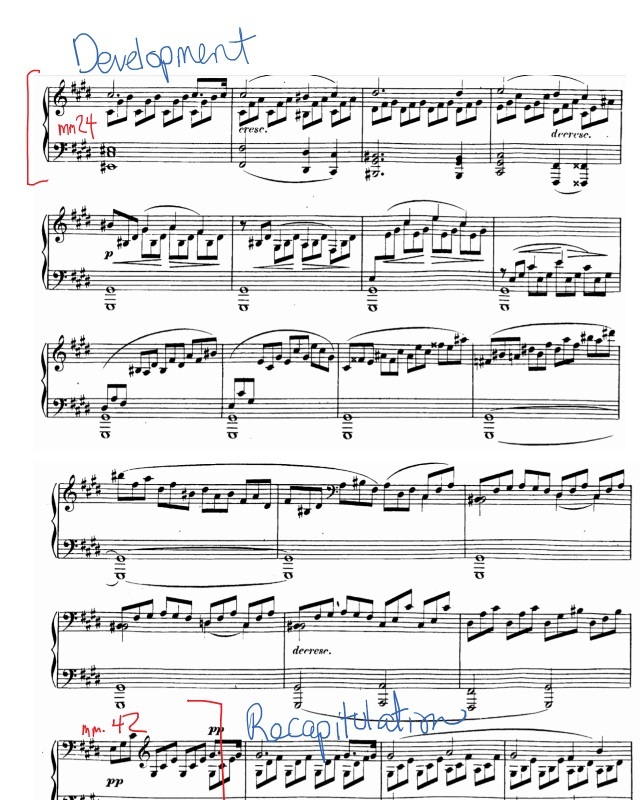 The first movements are pretty doable for a late intermediate student, but this last movement is quite advanced (something you’ll be able to tell when you listen to it). Let’s take a quick listen to the start of the exposition (this movement is in sonata form, which we’ll talk about shortly), so you can get the tune in your head. Interestingly, you’d think this would be a movement littered with fortissimos, blasting out through the whole piece. But the powerful sound of this movement isn’t achieved by blasting out a stream of loud notes – rather, it’s a few well-chosen accents in a sea of quiet playing (with the odd, short fortissimo section) that makes it have impact. Valentina Lisitsa’s interpretation of the final movement is my favorite – it’s so fast and fluid and exciting. I urge you to check it out! Let’s jump to the technical side of this movement. Like the first movement, it’s written in sonata form. You’ve got the exposition (mm. 1-65), development (mm. 66-102), recapitulation (mm. 103-158), and coda (158 to end). It’s an incredibly cool movement and I urge you to check it out in full, but for now let’s take a quick listen to the development section. I want you to take a listen to all the parallels from the exposition – it starts off virtually identical, except with some twists and turns. For example, the development section blasts off on a major chord. When you listen to the full version, you’ll hear all the ways in which the development section completely turns the exposition on its head. After the development, the recapitulation occurs, which is basically identical to the exposition, with a few minor changes. Composed by Ludwig van Beethoven (1770-1827). Edited by Murray Perahia and Norbert Gertsch. Henle Music Folios. Classical. Softcover. 28 pages. G. Henle #HN1062. Published by G. Henle (HL.51481062). Klaviersonaten. Composed by Ludwig van Beethoven (1770-1827). Edited by Bertha Antonia Wallner. Piano (Harpsichord), 2-hands. Urtext Editions. Pages: 283. Classical Period. Collection (softcover). With standard notation, fingerings, introductory text and thematic index (does not include words to the songs). 286 pages. G. Henle #HN32. Published by G. Henle (HL.51480032). Credit to: Allysia Kerney (1st movement) and Rob Hillstead.